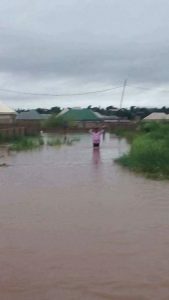 An estimated 110,000 people in 24 communities have been displaced by flood in Benue state. Executive Secretary, Mr Boniface Ortese, told the News Agency of Nigeria (NAN) in Makurdi on Wednesday that over 2, 769 households were also affected. In a swift reaction, President Muhammadu Buhari has directed the National Emergency Management Agency (NEMA) to immediately mobilize personnel and resources to assist victims of the flooding. Mr. Ortese explained that places affected included Achusa, Idye, Wurukum Market, Genabe, Industrial Layout, Demekpe, Wadata Market, Katungu, behind the Civil Service Commission, Agboughul-Wadata among others. “In Achusa 200 houses were affected with 5,125 persons displaced. In Idye 217 houses were affected while 5,200 persons were displaced. “Also, behind the Civil Service Commission 200 houses were submerged in flood and 5,777 persons were displaced. “At Genabe, 200 houses were affected with 5,021 persons displaced, 218 houses around the Wurukum market were affected with 1,000 persons displaced, and at Wadata market150 houses were affected and 4,300 persons were displaced. “Similarly at Industrial Layout, 69 houses were flooded and 4,310 persons displaced; Demekpe 111 houses were affected while 7,820 persons displaced,’’ the official said..
Ortese further said that 137 houses were flooded in Katungu with 6,031 persons displaced while at Agboughul-Wadata 201 houses were affected and 5,728 persons displaced. He said that government was doing everything within its little resources to assist flood victims in the state. Meanwhile, the state commissioner for Water Resources and Environment, Mr Joseph Utsev has urged the Federal Government to include Benue among states to benefit from the N1.6 billion ecological intervention fund. Utsev said that since 2013, the state had not received any ecological assistance from the Federal Government. He said that if adequate budgetary provisions were made, many disasters may be mitigated since natural disasters could only be controlled. The commissioner said that dredging the River Benue would provide permanent solution to the recurring flood in the state. “Benue Government is looking for ways in which River Benue can be dredged; this is because by dredging the river, majority of the water can be accommodated and thus, prevent future overflow. “The ongoing research so far, shows that the preliminary study would cost about N8 billion while the main project would gulp about N300 billion. “And this is where we need Federal Government financial intervention to execute the project, since the funds are much,’’ he said. 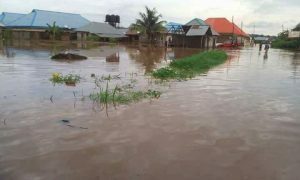 However, a cross section of Makurdi residents accused the Benue State Government of doing little to protect the citizens from flood disaster over the years. The resident said that the perennial flood disaster was an opportunity for some government officials to get free money and relief materials to divert. Mr James Udam, a resident of Idye Village told NAN that for over twenty years of his stay in the village, government has done nothing to protect residents despite their cries. Udam said that year in year out they have been affected by flood yet government keep making promises without any action. “This is where we find ourselves in Benue. Government officials are rather happy that there is heavy flood disaster so as to get free funds and relief materials to divert. Also, Mrs Juliana Agbo, a resident of Achusa, told NAN that their situation was pathetic as they have no shelter. According to her, government was yet to open camp for IDPs in the state. The News Agency of Nigeria (NAN) reports that government officials involved in emergency management are still awaiting the governor’s approval to open IDPs camps. The Akume led administration awarded a N2.2 billion contract to CAD Nigeria Limited for the construction of water drainage channel that will control all the running waters down to River Benue but the project was abandoned. Over 4000 households were submerged, property worth millions destroyed and scores died in the 2012 flood disaster.